"Directors' duties and liabilities: Disqualifying ‘unfit’ directors at banks? Political rhetoric and the directors’ disqualification regime"
Abstract: The purpose of the chapter is to assess the general scope of the UK’s directors’ disqualification regime, particularly section 8 of the Company Directors Disqualification Act 1986 which provides for the disqualification of ‘unfit’ directors. The shortcomings of the regime are assessed together with the current proposals for its reform which are prompted by the desire to facilitate the disqualification of errant senior bankers such as those who captured the attention of the media and, therefore, the wider public. The most prominent amongst these are HBOS’s Andy Hornby, Sir James Crosby and Lord Stevenson, together with the former CEO of the Royal Bank of Scotland (RBS), Fred Goodwin. 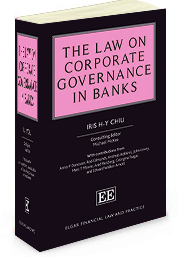 The chapter first considers the particular circumstances which led to the taxpayers’ bailout of the RBS and HBOS. The focus here is on the culpability of the senior executives of both institutions rather than upon the other contributing factors, such as the shortcomings of the regulatory regime, which led to the failure of the banks. The aim is to show that in the light of what happened in RBS and HBOS, the current timidity over the initiation of disqualification proceedings under section 8, seemingly prompted, as will be seen, by misgivings over whether there is sufficient evidence against the directors to at least establish a prima facie case, may be far too pessimistic. Second, it assesses the jurisprudence surrounding disqualification on the ground of ‘unfitness’. It will show that the substantive terms of this basis for disqualification contains ample scope to address the conduct of senior executives at HBOS and RBS, not least because the courts have refused to strait-jacket the test of unfitness with rigid categorisations. It concludes by considering recent political initiatives aimed at providing alternative routes for holding senior bankers liable for reckless behaviour. Professor Lowry is Chair of Commercial Law.